One of the painful realities for all dog owners is the likelihood that they will outlive their beloved pet. The grief over the loss of the family dog can be overwhelming, but a home burial can help to begin the healing process, and allow family members the opportunity to say goodbye. The death of a beloved dog is never timely. If your dog dies under the care of a veterinarian at the doctor's office, the vet may prepare your pet for burial or may be able to place your dog in temporary cold storage until you can bury him. If your dog dies at home and you don't plan to have a necropsy performed, you can place your dog in the freezer if his size allows. If you do plan to have a necropsy performed, place your dog in the refrigerator, as a frozen body cannot be autopsied properly. If your dog's size prohibits you from placing him in cold storage, place his unwrapped body on a cement floor, or wrap him in plastic, and place him in the tub, covered in ice until you can bury him. If the ground is too frozen for immediate burial, you may place your dog in an outbuilding, such as a shed, but take necessary precautions to make sure he won't be disturbed. If you dog is small, you may choose to bury him in a small box or coffin. Burial containers can be fashioned for a larger dog, or any dog can be buried in a shroud, such as your pet's favorite blanket. Choose your burial location carefully. Make sure you bury your dog in a location that won't become wet, and avoid any area you may excavate in the future. Make sure the burial plot is in a location that won't be scavenged by other animals. Check with your town or village official to make certain local ordinances allow you to bury your pet on your property. For at-home burials, you need to be cognizant of the location of wells and septic systems in rural areas, and educated on possible buried gas or electrical lines. Consider an 811 service that will connect you with professionals in your area who can help you avoid digging near gas and electrical lines. You also may choose a pet cemetery if at-home burial isn't an option. Once you've chosen your burial plot, dig a hole slightly larger in diameter than your coffin, box or shrouded pet, and at least 24 inches deep from the ground level to the top of your pet or burial container. Allow children to help if they ask to be involved. The opportunity to participate can help begin their grieving and healing process. A funeral service can help provide closure for grieving family members. 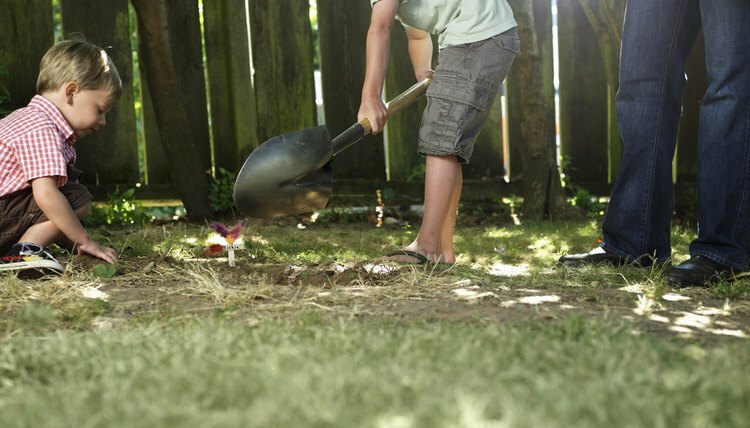 Allow children to participate if they show a desire to be there when your dog is buried. They may wish to place toys, letters or cards, photos or other mementos into the grave with their dog. Give them the opportunity to do what brings them comfort. Consider taking photos or a video of the memorial, and allow family members to offer words of comfort or tell stories about their pet. Placing a large stone or other marker will create a memorial for your pet when family members can go to reminisce and grieve their loss.